Integratore alimentare per il benessere delle vie urinarie - ESI S.p.A. This dietary supplement is made with titrated Cranberry, Bearberry, Goldenrod and Green Tea extracts. 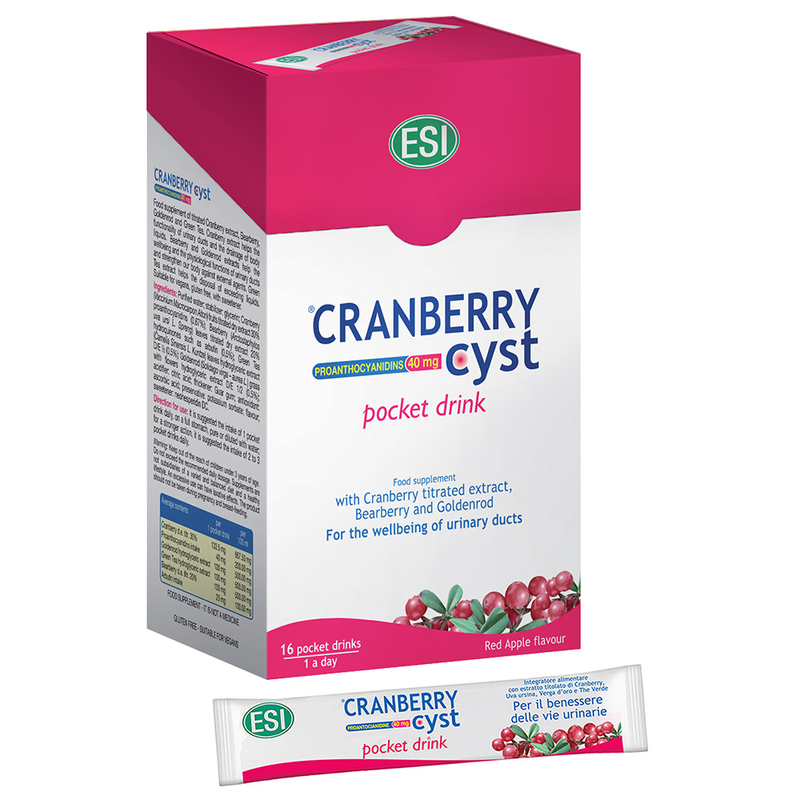 Cranberry helps to improve urinary tract function and gets rid of excess body liquids; additionally, Bearberry and Goldenrod extracts promote the functionality of the urinary tract and the boost the body’s immune system. Green Tea helps to get rid of excess fluids. This is vegan, gluten-free, sweetened product. 1 pocket drink daily on a full stomach, by itself or diluted in some water; for an extra strength effect, consume 2-3 pocket drinks a day. Warnings: Keep out of the reach of children three years of age or under. Do not exceed the daily recommended dosage. Supplements should not be considered a substitute for a balanced diet and a healthy lifestyle. Excessive consumption may produce laxative effects. Do not take this product while pregnant or breast feeding.